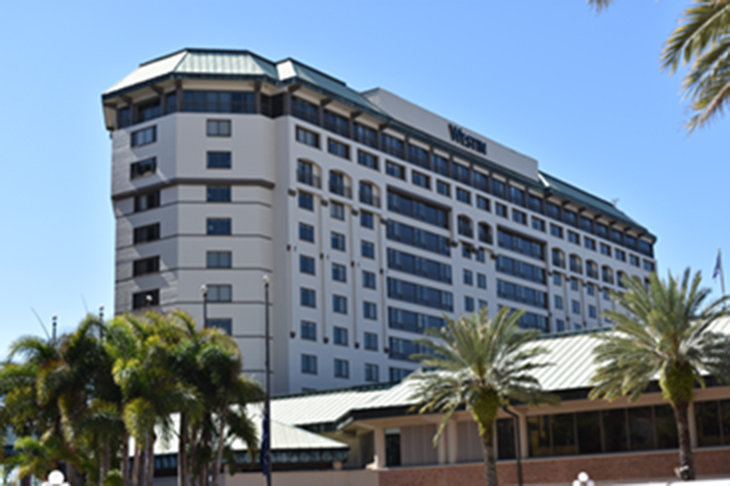 TAMPA BAY, Fla. (August 2018) — The Westin Tampa Waterside Hotel recently completed the restoration of its exterior that extended the service life of its façade by 25-30 years. Using NeverFade® Façade Restoration Coatings with Kynar Aquatec® from APV Engineered Coatings gave the hotel a much-needed facelift. 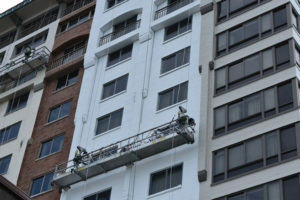 And they did it at a much lower cost than replacing the brick façade and window profiles or having to repaint the exterior every three to five years, which is a typical coating lifecycle in Florida. Stuart Dean crew at work on the Westin Tampa Waterside. Stuart Dean applied a water-based Neverfade ® coating from APV Engineered Coatings formulated with Kynar Aquatec® resins that will protect this facade for years to come. Photo courtesy Stuart Dean. Stuart Dean’s White Paper on Field Applied High Performance Coatings. Up in the Sky – It’s a Bird, It’s a Plane, It’s the Goodyear Blimp!